Drink Your Greens and Minerals! : The Truth About Alkalizing Your Blood and Tissues! Dr. Robert O. Young states: The pH of blood is constantly being challenged with environmental, dietary, respiratory, and metabolic acids. The body deals with blood acids by eliminating these acids through the four channesl of elimination (urination, perspiration, defecation and respiration) and the buffering of acids through the alkaline buffering system in order to maintain the delicate pH balance of the blood plasma at 7.365. Dr. Robert O. Young states: The pH of your extracellular fluids, which includes the blood plasma is kept at a very narrow range at 7.365 to 7.385. Any pH measurement of blood plasma in excess of 7.385 indicates a condition of compensated acidosis and any pH measurement of blood plasma below 7.365 indicates a condition of decompensated acidosis. When the pH of the blood plasma increases above the 7.385 this is the result of the blood pushing environmental, dietary, respiratory and metabolic acids out into the tissues as the blood is pulling alkaline mineral salts such as calcium ions from the bones or magnesium ions from the muscles to offset the increase of acids in the blood. It is always a sure sign that as the blood plasma is becoming more alkaline that the tissues are becoming more acidic and this is the cause of all inflammatory and degenerative diseases. When the body tissues, organs, cells,or the alkaline reserves (sodium, calcium, magnesium and potassium) become deficient in alkaline minerals the blood plasma the pH will drop below the ideal 7.365 causing decompensated acidosis leading to hemolysis at a pH below 7.365 or a coma and/or death at a pH below 7.2. Dr. Kim Ben states: If the pH of your blood falls below 7.35, the result is a condition called acidosis, a state that leads to central nervous system depression. Severe acidosis - where blood pH falls below 7.00 - can lead to a coma and even death. Dr. Robert O. Young states: If pH of the blood plasma drops below 7.365 the result is called decompenated acidosis. If the pH of the blood plasma stays at the ideal 7.365 this is called compensated acidosis. And if the pH of the blood plasma increases above the 7.365 this is called "latent tissue acidosis". The blood plasma pH always goes alkaline when the blood pushes out environmental, dietary, respiratory or metabolic acids out into the tissues. These acids are always deposited into what I call the 'acid catchers' which are the connective tissues. This leads to whati I call 'latent tissue acidosis'. As acids build-up in the connective tissues and if NOT eliminated by the lymphatic system and the out through the channels of elimination, including the skin, lungs, bowels or urine this will result in ALL the connective tissue diseases and degenerative diseases, including cancerous conditions. Dr. Kim Ben states: If the pH of your blood rises above 7.45, the result is alkalosis. Severe alkalosis can also lead to death, but through a different mechanism; alkalosis causes all of the nerves in your body to become hypersensitive and over-excitable, often resulting in muscle spasms, nervousness, and convulsions; it's usually the convulsions that cause death in severe cases. Dr. Robert O. Young states: If the blood plasma pH increases over 7.385 you are in a state of 'latent tissue acidosis' and a high risk for cancer. This is what I call the "tee-ter-totter effect". The body is pulling alkaline minerals into the blood to compensate for an equal amount of acids being pushed out into the connective tissues to keep the blood plasma in an alkaline state. The result is tissue acidosis which then leads to hypersentive and over-excitable nerves, muscle spasms, nervousness and convulsions that can lead to coma or even death. All of these symptoms are NOT a result of too much base or alkalinity but the result of too much acid from the blood being deposited into the tissues. The cause of 'latent tissue acidosis'is acidic lifestyle and dietary choices. Dr. Kim Ben states: The bottom line is that if you're breathing and going about your daily activities, your body is doing an adequate job of keeping your blood pH somewhere between 7.35 to 7.45, and the foods that you are eating are not causing any wild deviations of your blood pH. Dr. Robert O. Young: The bottom line is when you understand that when you have an acidic lifestyle and diet it does affect the blood plasma pH in a negative way. The blood responds to increase acids from lifestyle and diet by pushing them out into the connective tissues or the colloidal connective tissues of the schade. The foods you eat, the liquids you drink, even your thoughts affect the pH of blood and then the tissues. The blood is constantly responding to the acids of lifestyle and diet! Dr. Kim Ben stated: So what's up with all the hype about the need to alkalize your body? And what's to be made of the claim that being too acidic can cause osteoporosis, kidney stones, and a number of other undesirable health challenges? Dr. Robert O. Young states: The hype about alkalizing your blood and then tissues is important because the human body is alkaline by design and acidic by function. This is the foundation of understanding the true cause of ALL sickness and disease. Dr. Kim Ben states: As usual, the answers to such questions about human health can be found in understanding basic principles of human physiology. So let's take a look at the fundamentals of pH and how your body regulates the acid-alkaline balance of its fluids on a moment-to-moment basis. Dr. Robert O. Young states: The problems with current understanding of the basic principals of human physiology is the basic principals do NOT understand that the human body is alkaline by design and acidic by function. Current medical savants of NOT understandthat there is only one health, one sickness, one disease and one treatment. The one health is to maintain the alkaine design of the blood and tissues with an alkaline lifestyle and diet. The one sickness and one disease is the over-acidification of the blood and then tissues due to an inverted way of living, eating and thinking. The one treatment is to restore the alkaline design of the body fluids with an alkaline lifestyle and diet. Remember the fish bowl metaphor? It goes llike this - When the fish is sick what would you do? Treat the fish or change the water? Remember the fish is only as healthy as the water it swims in. Dr. Robert O. Young states: pH is a measurement of the concentrations of hydrogen and hydroxyl ions in a aqueous solution. Any aqueous solution, like your blood plasma that is saturated in hydrogen ions is less or more acidic and any aqueous solution that is saturated in hydroxyl ions is less or more base or alkaline. Once again, the human body is alkaline in its design and acidic in its function. Your blood plasma needs to be maintained at a delicate pH of 7.365 for your cells to function properly. I have found in my research that when your pH is stable at 7.365 you find healthy blood which is even in color, even in size and even in shape. The red blood cell is the primary stem cell which becomes all other body cells. 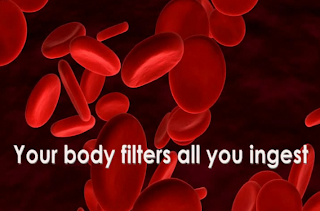 And the health of the blood is directly connected to the health of all body cells. It is blood that becomes, liver, heart, brain and skin cells. All red blood cells and then body cells are made up of microzymas. Microzymas are the foundational, indestructable matter and intelligent matter that makes up all living cells, including the DNA. The tinest changes in the pH of the body fluids can cause the microzymas in the red blood cells or body cells to change into bacteria, yeast and/or mold. This is how germs are created - from within NOT from without. Dr. Kim Ben states: The pH scale ranges from 0 to 14. A liquid that has a pH of 7 is considered to be neutral (pure water is generally considered to have a neutral pH). Fluids that have a pH below 7 - like lemon juice and coffee - are considered to be acidic. And fluids that have a pH above 7 - like human blood and milk of magnesia - are considered to be alkaline. Dr. Robert O. Young states: The pH scale ranges from 0 to 14 with the pH of 7 being the midpoint (pure water may have a pH of 7 but I have found that the pH of pure water has a range of 6.2 to 7.2 - a 10 times exponential swing. I have also found that pure water has an oxidative reduction potential in a range of +50mV to +150mV) which will drain energy from the body. Lemon is an alkaline fruit not an acidic fruit. This is because of its low sugar and high alkaine mineral content of potassium bicarbonate. Lemons do not draw down on the alkaline buffering system and contribute in excess of 10 times in hydroxyl ions in relationship to its hydrogen ion content. Dr. Kim Ben states: It's important to note that on the pH scale, each number represents a tenfold difference from adjacent numbers; in other words, a liquid that has a pH of 6 is ten times more acidic than a liquid that has a pH of 7, and a liquid with a pH of 5 is one hundred times more acidic than pure water.Most carbonated soft drinks (pop) have a pH of about 3, making them about ten thousand times more acidic than pure water. Please remember this the next time you think about drinking a can of pop. Dr. Robert O. Young states - All food and drink which has a pH of less than 8.4 will cause the release of sodium bicarbonate from the salivary glands, the pylorus glands, the pancreas, gall bladder and intestinal glands to alkalize whatever ingested. The main purpose of the digestive system is to prepare the food in a liquid state at a pH of 8.4 for biological transformation into stem cells. Dr. Kim Ben states: Also, as your cells produce energy on a continual basis, a number of different acids are formed and released into your body fluids. These acids - generated by your everyday metabolic activities - are unavoidable; as long as your body has to generate energy to survive, it will produce a continuous supply of acids. Dr. Robert O. Young states: Metabolism produces acidic waste products if not eliminated will cause dis-ease and then disease. You are only as healthy as the alkaline fluids of the body. Dr. Kim Ben states: So there are two main forces at work on a daily basis that can disrupt the pH of your body fluids - these forces are the acid or alkaline-forming effects of foods and liquids that you ingest, and the acids that you generate through regular metabolic activities. Fortunately, your body has three major mechanisms at work at all times to prevent these forces from shifting the pH of your blood outside of the 7.35 to 7.45 range. Dr. Robert O. Young states: There are six main sources at work on a daily basis that can disrupt the pH of your bldy fluids - these forces include acids from the environment, acids from the foods and liquids ingested, acids from metabolism, acids from cells breaking down or catobolic acitivity, acids from endogenous bacteria, yeast and mold, and acids from respiration. Your body has an elaborate alkalizing buffering system at work at all times to help prevent through chelaton these forces from shifting the pH of the blood plasma pH as well as the interstial fluid pH at a delicate pH of 7.365. It is important to note that when the alkaline buffering system becomes depeted and acids are being deposited into the connective and fatty tissues this is when dis-ease and eventual disease manifests. The sodium bicarbonate system - the main organ of production is the stomach. The stomach is the major organ for sodium bicarbonate production for alkalizing food and maintaining the alkaline pH of the blood, tissues and organs. The hemoglobin buffering system - the hemoglobin is a secondary alkalizing buffer for the blood when there is insufficient elements for the production of the primary buffer, sodium bicarbonate. This is the main cause of ALL blood diseases and why most all the client/patients I see have to a lesser or greater degree anemic and unhealthy blood. The pHosphate buffering system buffers acids creating phosphoric acid which is then excreted via the urine. The ammonia buffering system reacts with hydrogen ions or acids to form ammonium ions which are excreted into the urine. The plasma protein buffering system helps to chelate acids. The most plentiful type of buffer in the body including glutathione, methionine, cysteine and taurine which are found in the cells, lymph fluid and plasma. Most plasma protein activity occurs intracellularly to bind or neutralize acids during cellular metabolism and/or disorganization or transformation of the human cell. The electrolyte buffering system which includes the alkalizing mineral salts of sodium, magnesium, potassium and calcium. The chelation of any acid will form a less toxic solid or a stone in the body. All stones and cysts and tumors are the result of excess acids in the extra and intracellular fluids. The electrolyte or mineral buffers work in the blood, lymph, extracellular and intracellular fluids to bind acids which are then removed via the urine. These four elements are recycled by the kidneys into the blood and lymph by binding them to CO2. Over 90 percent of the CO2 produced in the body through cellular fermentaiton in the production of energy is used to carry out this recycling process. The low density lipo protein buffering system also referred to as cholesterol works primarily as a binder of acids in the blood, lymph, and extracellular fluids which are then exreted via the urine. If elimination is compromised the fat bound acids are removed away from the organs that sustain life inot the body cavities, hips, thighs, buttocks and abdominal area. This is the cause of over-weight and obesity. The endocrine buffering system releases hormones to buffer acids. These hormones include the antidiuretic hormone which regulates the rate at which water is lost or retained by the body and aldosterone which regulates the level of sodium ions and potassium ions in the blood. These two alkaline secretions help the kidneys maintain the alkaline design of the body and reduce excess acidity thus creating pH balance in the body. The release of free radicals by the lymphocytes to buffer excess acids. The retention of alkaline water to buffer excess acids in the tissues. This is the cause of edema or water retention. Dr. Kim Ben states: It's not in the scope of this post to discuss the mechanisms listed above in detail. For this article, I only want to point out that these systems are in place to prevent dietary, metabolic, and other factors from pushing the pH of your blood outside of the 7.35 to 7.45 range. Dr. Robert O. Young states: The blood can be stressed from dietary and metabolic acids which are eliminated through the four channels of elimination or buffered by the ten alkalizing buffering mechanisms to maintain the delicate blood plasma pH at a healthy 7.365. Dr. Kim Ben states: When people encourage you to "alkalize your blood," most of them mean that you should eat plenty of foods that have an alkaline-forming effect on your system. The reason for making this suggestion is that the vast majority of highly processed foods - like white flour products and white sugar - have an acid-forming effect on your system, and if you spend years eating a poor diet that is mainly acid-forming, you will overwork some of the buffering systems mentioned above to a point where you could create undesirable changes in your health. Dr. Robert O. Young states; Everything you eat, everything you drink, everything you think and everything you do affects the blood in an acidic way to a lesser or greater degree. That is why we age. We do not get old we mold from years of acidic lifestyle and dietary choices. The key to a healthy life or disease and eventual death is in the blood! Especially the blood plasma. Dr. Robert O. Young states: Dr Kim Ben has described the cause of bone loss correctly. It is important to remember that the activation of the pHosphate buffering system does not happen when you are on an alkalizing lifestyle and diet and hyperperfusing the blood and tissues with alkalinity. The alkaline lifestyle and diet is outlined in my book, The pH Miracle Revised and Updated. Dr. Ken Ben states: This is just one example of how your buffering systems can be overtaxed to a point where you experience negative health consequences. Since your buffering systems have to work all the time anyway to neutralize the acids that are formed from everyday metabolic activities, it's in your best interest to follow a diet that doesn't create unnecessary work for your buffering systems. Dr. Robert O. Young states: The protocol that will NOT unnecessarily activate the alkaline buffering systems of the body is outlined in the pH Miracle Revised and Updated by Dr. Robert and Shelley Young. Dr. Robert O. Young states: Generally, all green fruit and vegetables are the ONLY alkalizing foods for the blood and tissues and are critical in building healthy blood and then healthy body cells. Dr. Kim Ben states: Most grains, animal foods, and highly processed foods have an acid-forming effect on your body fluids. Dr. Robert O. Young states; All grains, animal foods, dairy products, fermented foods, algae, probiotics, enzymes, high sugar fruit, high sugar vegetables are acidic to the blood and tissues and activate the alkaline buffering systems. Dr. Kim Ben states: Your health is best served by a good mix of nutrient-dense, alkaline antacids-forming foods; ideally, you want to eat more alkaline-forming foods than acid-forming foods to have the net acid and alkaline-forming effects of your diet match the slightly alkaline pH of your blood. Dr. Robert O. Young states: The only way to achieve extraordinary health and fitness is with the pH Miracle Lifestyle and Diet as outlined in The pH Miracle Revised and Updated. Dr. Robert O. Young states: The four alkalizing food groups are chlorophyll from green fruit and green vegetables, mono and polyunsaturated oils, alkalizing water and finally alkalizing mineral salts. I call this the COWS Plan as outlined in The pH Miracle Revised and Updated. Dr. Kim Ben states: The primary purpose of this article is to offer information that explains why I believe that you don't need to take one or more nutritional supplements or "alkalized water" for the sole purpose of alkalizing your body. Your body is already designed to keep the pH of your body fluids in a tight, slightly alkaline range. Dr. Robert O. Young states: Your body is alkaline by design but acidic by function and that is why you have to follow an alkaline lifestyle and diet to prevent ALL sickness and disease and remain strong, healthy and fit. Drinking alkaline water is essential to maintaining the healthy alkaline state of your body! Dr. Robert O. Young states: The ideal scenario is to make fresh organic electron-rich green alkalizing fruit and vegetables the centerpiece of your diet with liberal amounts of alkalizing oils, alkalizing water and finally alkalizing mineral salts. Dr. Robert O. Young states: I hope these scientific truths brings some clarity to Dr. Kim Ben and others that are confused about the biochemistry, bioenergetics and the importance of alkalizing the blood and tissues with an alkaline lifestyle and diet.